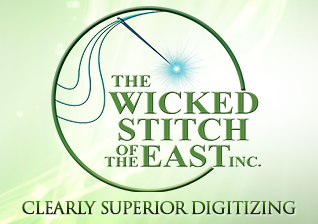 By submitting your design file to Wicked Stitch of the East, you acknowledge that you have obtained all proper permissions or licensing for the use of any logo, pattern or design protected by copyrights, patents, trademarks or other intellectual property rights and you hereby agree to hold harmless and indemnity Wicked Stitch of the East and its partners, employees, affiliates and agents against all loss, expenses, damages, costs and legal fees by reason of any actions based on the infringement thereof. You also understand that it is your responsibility to proof the digitized design prior to production and Wicked Stitch of the East is not responsible for any damaged garments. While Wicked Stitch of the East acknowledges and understands that all logos, patterns and creative art works submitted for digitizing are the copyright of their respective owners, Wicked Stitch of the East reserves the right to use the items listed below as a part of its portfolio, case study, etc. (whether online or offline) for the purposes of showcasing its embroidery digitizing capability and quality of work, and advertising for its service. Through this Web site you are able to link to other Web sites which are not under the control of Wicked Stitch of the East. We have no control over the nature, content, availability and privacy practice of those sites. The inclusion of any links does not necessarily imply a recommendation or endorse the views expressed within them.